The Avalon Village is a sustainable eco-village being built in Highland Park, MI (inside the city of Detroit). We are transforming one of the city’s most blighted blocks into a safe, functional, and beautiful space for the entire community. The inspiration behind this transformative project is 2 year-old Jakobi RA who was killed by a hit-and-run driver in 2007. We honor his memory and embrace his vibrant spirit in everything we do. 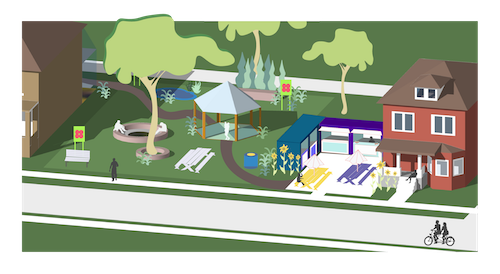 Our first installation, Jakobi RA Park, serves as a gathering place for celebrations, community service projects, activities and events throughout the year. Construction is underway right now on The Homework House, The Goddess Marketplace and landscaping/beautification. Future plans include The Avalon Village Healing House, The Blue Moon Cafe and The Avalon Village Community Greenhouse. Follow our progress on Facebook, Instagram and Twitter! The Homework House is a big, renovated brick house where children will receive healthy meals and help with their homework. The house will also feature a computer lab and STEM lab, a kitchen, laundry and shower facilities, a recording studio, and comfortable places to study and learn. 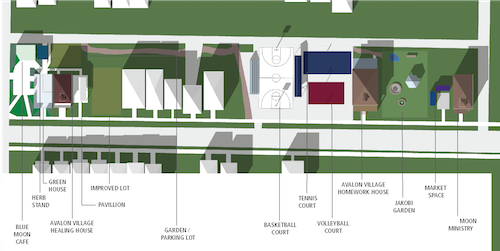 Outside, there will be tennis, volleyball and basketball courts and seating. Made from repurposed shipping containers, The Goddess Marketplace is an economic development initiative for women. Local artisans will be able to sell their goods and grow their entrepreneurial ventures in the marketplace storefronts alongside other women who share their passion and creativity. The structure is low-cost and that will keep the rents affordable for our vendors. We are beautifully landscaping Avalon Street from Woodward to Second. Our ongoing efforts include removing trash and debris, clearing brush and trees, planting flowers and plants, and keeping lawns freshly cut and manicured. We have created a landscaping company in our village to create jobs for members of our community. An abandoned but sturdy brick house on the block will be fully renovated, creating The Avalon Village Healing House, a peaceful space for holistic healing from yoga to massage, reiki and more. The Healing House will employ community members who have passion for, and training in, the healing arts. An abandoned garage at the corner of Avalon and Second will be brought back to life as The Blue Moon Cafe, a vegetarian cafe providing healthy food and new jobs. Our nearby greenhouse will help us grow the vegetables, fruits, herbs and flowers needed for the café and The Homework House. The Blue Moon Cafe will also hold free community lunches and dinners for our homeless and low-income neighbors. Another exciting feature of the Avalon Village is our solar streetlight! We have the very first residential solar-powered streetlight in Highland Park, installed by the non-profit membership group Soulardarity in 2014. Our city’s streetlights were removed in 2011 due to outstanding municipal debts. Today, our light always shines in the Avalon Village, powered by clean, affordable, green energy. 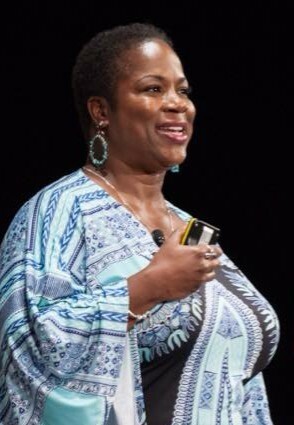 Shamayim ‘Shu’ Harris, a mother, a community activist and a former school administrator, is the founder and CEO of Avalon Village in Highland Park. Her dream of building this urban oasis was manifested after the tragic loss of her son, Jakobi RA, who was killed by a hit and run driver in 2007 at the age of two. 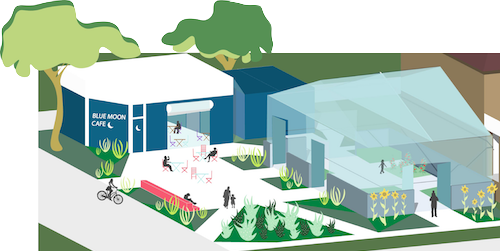 Rather than fall into despair, Shu chose to heal and honor Jakobi’s memory by transforming blight to beauty and creating something wonderful for the people of Highland Park. 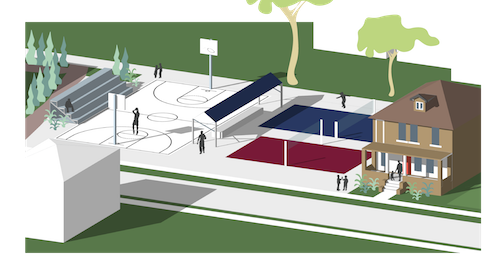 She assembled a team of engineers, futurists, artists, urban farmers, volunteers and donors from around the world who are helping to build Avalon Village, a sustainable eco village on Avalon Street between Woodward and Second. The village currently owns 20 parcels of land and 4 houses with plans to acquire more property. These vacant, blighted lots and structures are being brought back to life as the Homework House (an after school learning and activity center for neighborhood children), the Goddess Marketplace (an economic development initiative for women entrepreneurs), the Healing House (a center for holistic healing), a healthy cafe, activity courts, greenhouses, a micro library and more. Our unique community building project has received local, national and international media attention on The Ellen Show, NBC Nightly News, CBS Evening News, HLN, Detroit’s ABC, NBC, and FOX TV affiliates, WWJ, WJR, WDET and 910AM radio, and in People Magazine, Huffington Post, The Detroit News, Crain’s Detroit Business and numerous other print and online publications. Comedian and talk show host Ellen DeGeneres even gifted Mama Shu a prefabricated house which is expected to be delivered this spring and will serve as the village headquarters. Shu also serves as the first female chaplain with the Highland Park Police Department. She is the chairwoman of the Highland Park Charter Commission, which is charged with helping shape the city’s future. In addition, she served as Vice President of the Highland Park Housing Commission. She has dedicated her life to serving the people (especially children and elders) in her community, demonstrating that one person truly can make a difference, even against seemingly impossible odds, and inspiring others to live without fear and follow their dreams.